This book is not meant to be a scientific examination of the dolphin species. There are many resources available out there that do a far better job at that than I ever could. 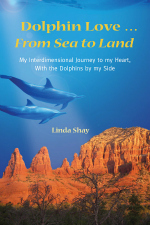 Rather, this is my personal spiritual adventure story—and my love story—with the dolphins. This is a true story. It takes place on land, in the sea, and in the realm of spirit … in other dimensions of reality. I invite you to float through these pages with an open mind, a receptive heart, and an adventurous spirit. Many of my readers have told me they received transmissions of dolphin energy while reading this book. This may happen for you too! Invite the dolphins to play with you. Open your heart and let them in … and then pay attention to your life. Since you were attracted to this book, I suspect your personal dolphin adventure story has already begun! May this story inspire you on your own unique path upon planet Earth. Open your eyes, your heart, and your mind, and look around you. Who or what are your special teachers? Follow the beauty. Follow the magic. Follow your joy. In so doing, you will discover your own precious heart, your own true nature. And, in this, we will all find freedom. I know that to be the wish for all of humanity from our dolphin brothers and sisters. It is a joy and a privilege for me to be in service to my fellow humans, and to this precious planet, by bringing the gifts of the dolphins … from sea to land.